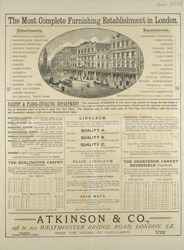 This is a leaflet for Atkinson & Company and they are advertising their stock of carpets and floor coverings. Fitted carpets were thought to be a great extravagance during the 19th century because they were built-in to the room and could not be taken when the family moved. Large rugs with Turkish designs were popular instead as these could be bought in many different sizes and because they were not fixed they made cleaning much easier. Carpets and rugs would have been made from heavy material and would have been densely patterned so that the dirt didn’t show so noticeably.